Give an interesting twist to the popular kakanin 'palitaw.' How about adding yema as its filling? Here’s a simple recipe to make palitaw de leche. <>As previously mentioned, food businesses must be more innovative and creative enough to entice more customers this year. That is why it is not surprising to see many variations of our favorite kakanin, with different twists, usually combined with other desserts to make them better and more intriguing to the palate. This season, prepare to give the traditional palitaw a new twist. Local foodies would surely like the idea of palitaw with filling. There is better way to make it more interesting than to combine it with another favorite local dessert---yema . Combine palitaw and yema and you would have palitaw de leche. According to a TV magazine show, this idea started in Bulacan. Learn how to make it. Here’s the simple recipe. 1. Make yema first. Mix egg yolks, vanilla extract, and condensed milk in a saucepan. 2. Cook over low heat, stirring constantly until the mixture becomes creamy in color. 3. Stop cooking and set aside until it cools down. Proceed to making palitaw. 4. 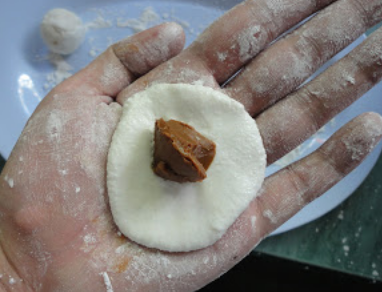 Make your dough by combining glutinous rice flour and water. 5. Scoop a tablespoon or 2 tablespoons of the dough. Mold it into a ball before flattening it using your hands. 6. Get a small scoop of yema and put it in the middle of the flattened dough. 7. Enclose yema by wrapping the dough around it to form a ball. 8. Boil some water in a cooking pit. Slowly put the dough pieces into it. 9. Scoop out each dough as it floats. Set aside to allow water to properly drip. 10. 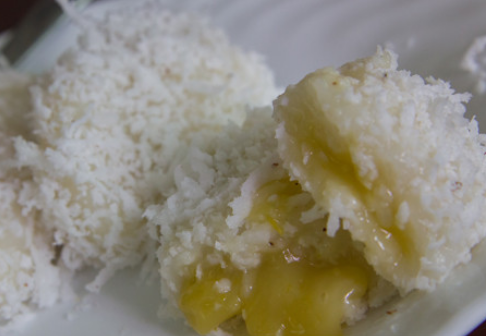 Roll each cooked dough into grated coconut with sugar and sesame seeds. Serve or sell.